I'm about to say something a bit controversial; I'm not the biggest fan of festive drinks. I like my coffee as bitter as my heart (that is a joke, don't worry mum my heart is super warm) so adding in a ton of syrup just doesn't do it for me. 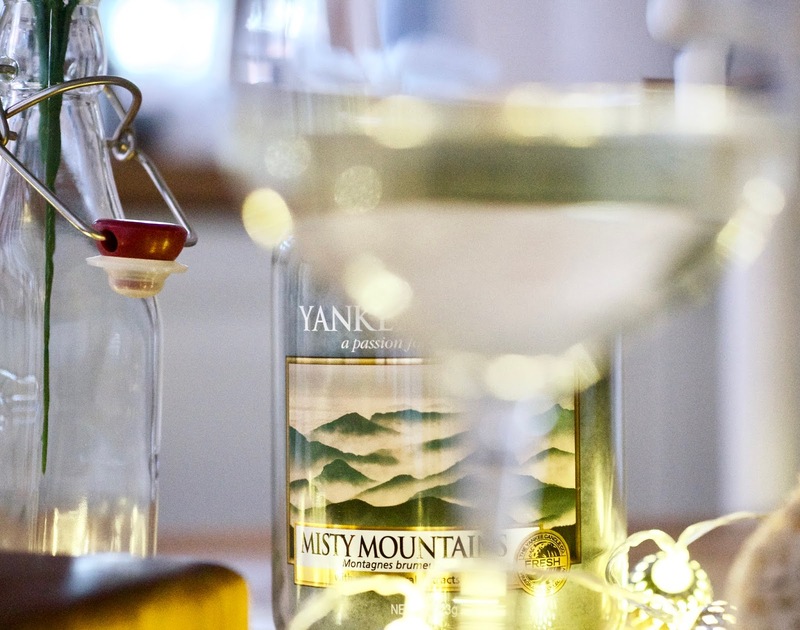 However, I do occasionally like to get a little inventive at home, where I can be in control of my festive drinks and have a bit of an experiment. 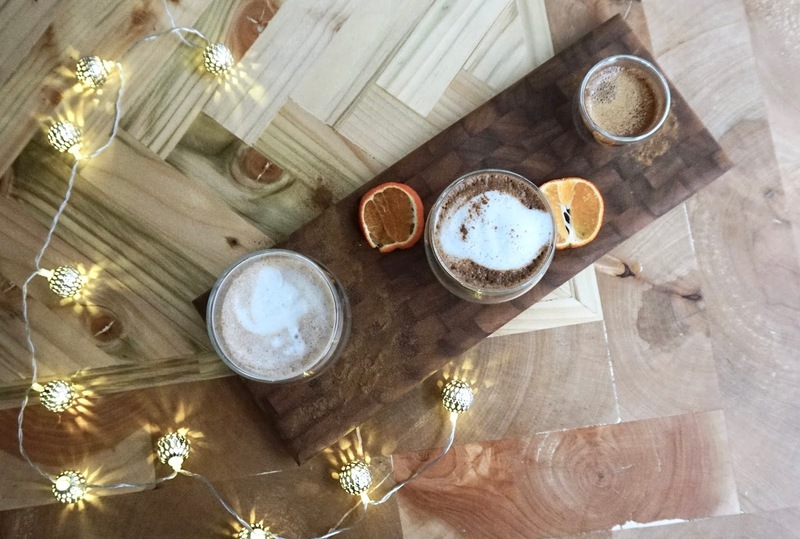 So if you're equally as unimpressed with festive offerings from coffee shops, these ones just might float your boat (or sleigh - HA). Gingerbread Latte | I love ginger, but gingerbread lattes in cafes are waaaay too sweet (I am fun at parties I promise) so I made my own using ground spices. I whisk the spices with a drop of milk to make a paste then add the espresso and steamed milk. 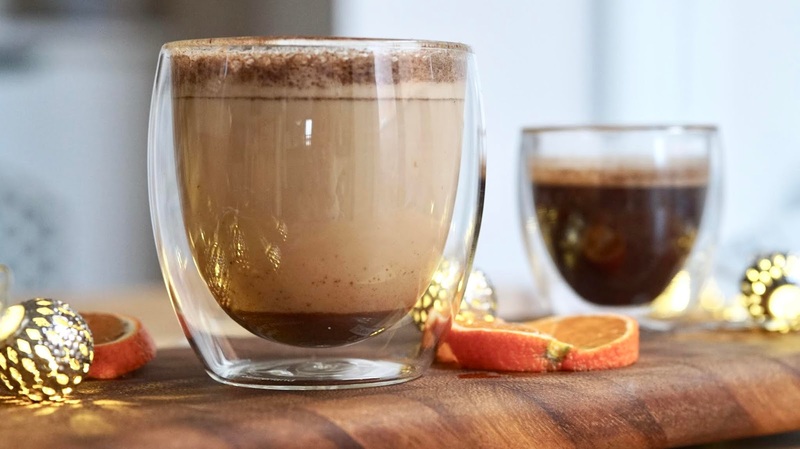 Mulled Cappucino | Like mulled wine but in coffee form (very proud of this one), again I mixed the spices with a bit of milk, squeezed in the orange then added the espresso and milk. Cinnamon Vanilla Espresso | I saved the easiest and least inventive one until last. This one uses syrup (top tip, TK Maxx do some fab ones) and just sweetens up the espresso a little. I actually quite like using syrup at home because I can just add a really small amount. 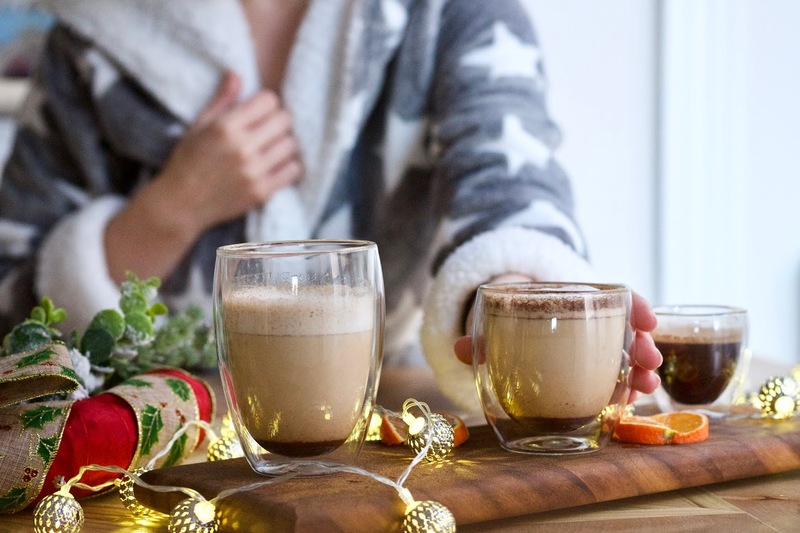 Are you a fan of festive drinks? AD | What Makes A Great Staycation? 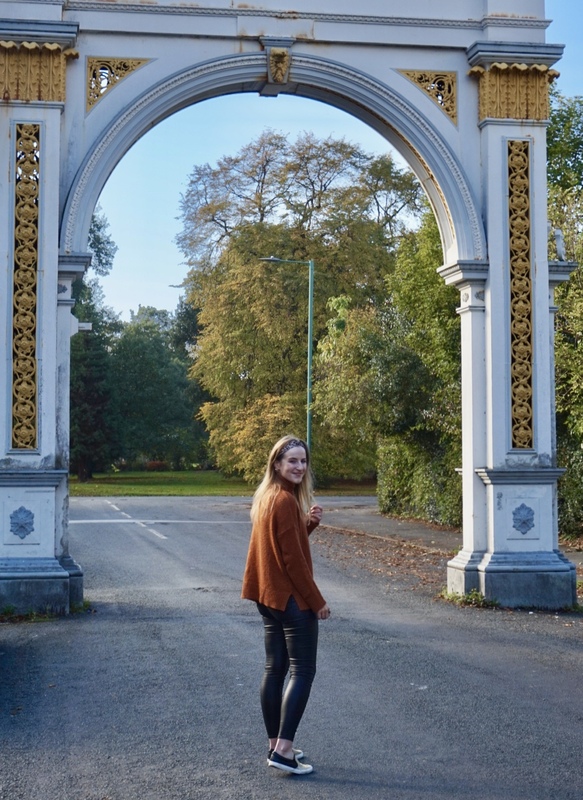 I'm a big fan of a staycation, something you'll know if you've been reading this blog for a while, so when I was contacted by the lovely team at My Hotel Break I jumped at the chance to see what they have on offer and my little break with them got me thinking; what makes a great staycation? 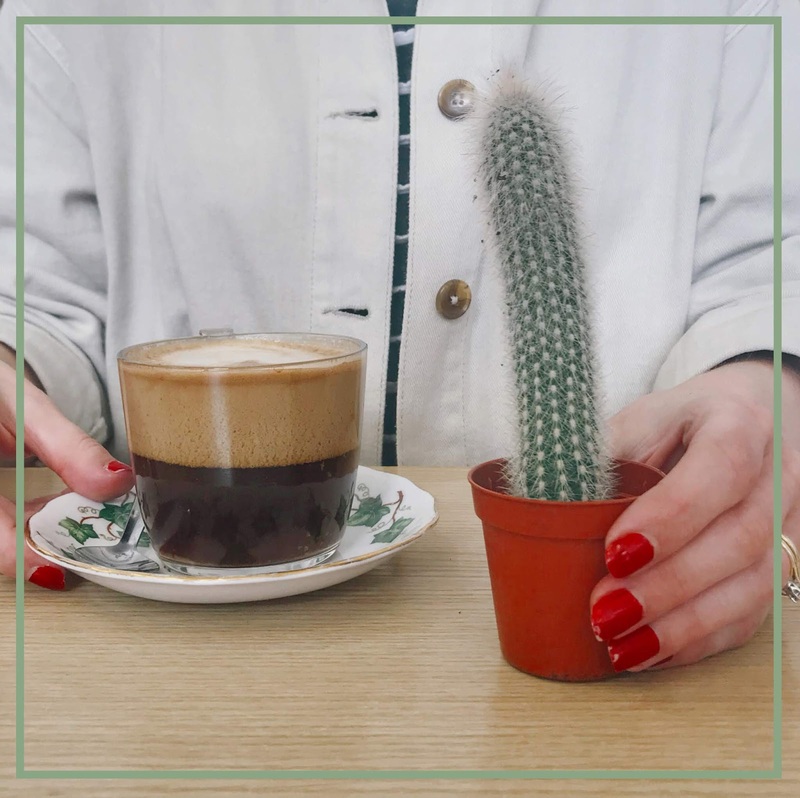 E X P E R I E N C E | I don't know about you, but when I'm booking a staycation I don't want to have to think too much about it so I'd rather opt for a deal that already provides me with things to do. My Hotel Break aim to provide an 'experience' rather than just a hotel room, whether that's a spa break, a murder mystery or a walking holiday. 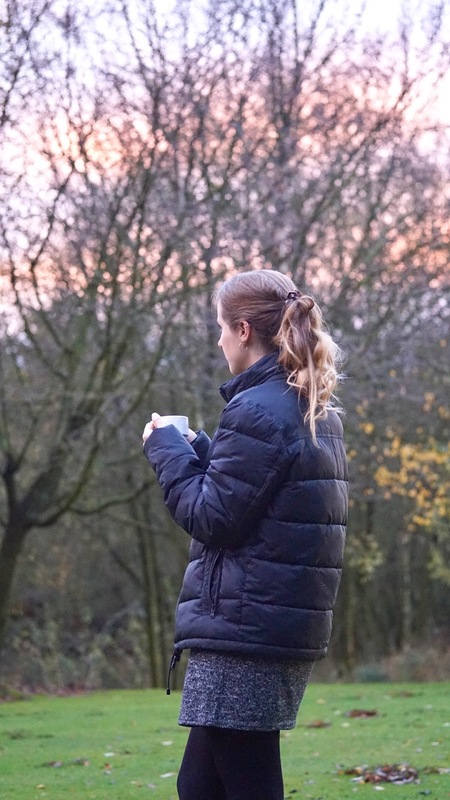 We stayed at the Chevin Country Park Hotel in Otley, West Yorkshire (one of my favourite parts of the country FYI) and it was everything I look for in a staycation experience; a cosy room, a pool and leisure facilities (hello hot tub) in an idyllic setting. L O C A T I O N | Although I love holing myself up in a hotel and staying there for the majority of my break, I also like having the option of venturing out somewhere if I wish. On this occasion, we spent the morning in Otley before checking in (and subsequently holing ourselves in) to our hotel. 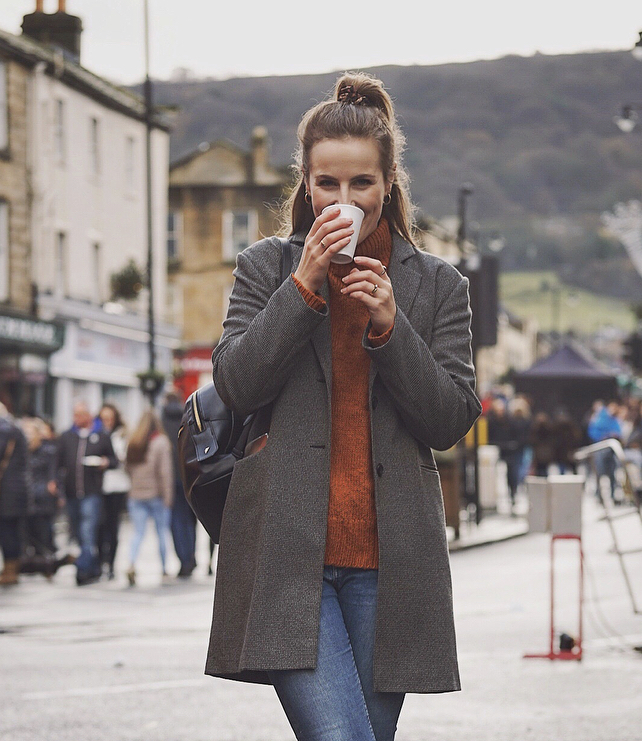 Whether it's a cute town like Otley to explore (with ample coffee shops, obviously) or picturesque countryside to walk around in, I always think about location before booking. R E L A X A T I O N | One thing I adore about staycations is the ability to relax that you don't necessarily get with a holiday abroad (or at least you don't if you're like me and squeeze out every last bit of energy you have to explore somewhere). If I'm staying in the UK it's because I want to relax, which was the exact kind of break that My Hotel Break and The Chevin provided us with. E A S Y B O O K I N G | As I've already mentioned, I like to not think too much about booking a staycation and luckily, with My Hotel Break, the booking process is simple. You can choose a hotel based on location, price or the type of experience you're looking for so you can find exactly what you want from your break with just a few clicks. With it being a small family run business it's also very personal and friendly; the team are always on hand to help, answer any questions and be generally lovely! They also offer free cancellation, which is extremely handy if you work flexible shifts like me, which often have to change last minute. S O M E T H I N G U N I Q U E | Don't get me wrong, I love a Premier Inn for a city break or as somewhere to stay when I'm going to gig, but when I'm having what I'd call a 'proper' staycation I love staying somewhere a bit unique with lots of character. 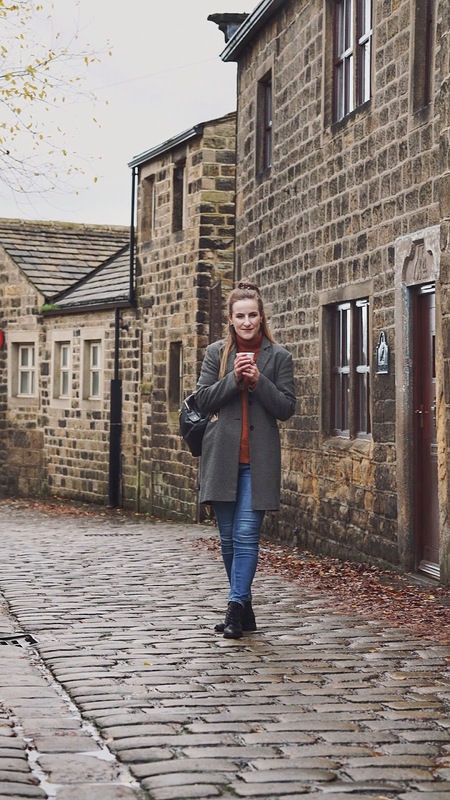 My Hotel Break specialise in smaller, independent hotels so you can discover places like The Chevin, which are more off the beaten track and which really have their own personality (yes I'm claiming that hotels have personality here, hear me out OK). The Chevin had a real lodge vibe to it, which felt so festive and cosy and almost made it feel like we were staying in a ski chalet. There was a lot of wood, an open fire and a view of the lake to wake up to. Well it's been a while since I did a book post hasn't it? I didn't read as much as I'd have liked to over summer, but during the colder months you're much more likely to find me in a cosy corner with a book (either that or watching Ex On The Beach just in case you had the impression that I have any sort of taste). The Passenger by Lisa Lutz | Without giving too much away, this is the story of a woman on the run from a crime she didn't commit, who in the process of running essentially ends up becoming a criminal. I love books where you're not sure whether to like the main character or not; I certainly empathised with her, but she wasn't a particularly nice person. She was flawed and all the characters were so 'human' in that way. I was completely gripped by this book and finished it in a couple of days. 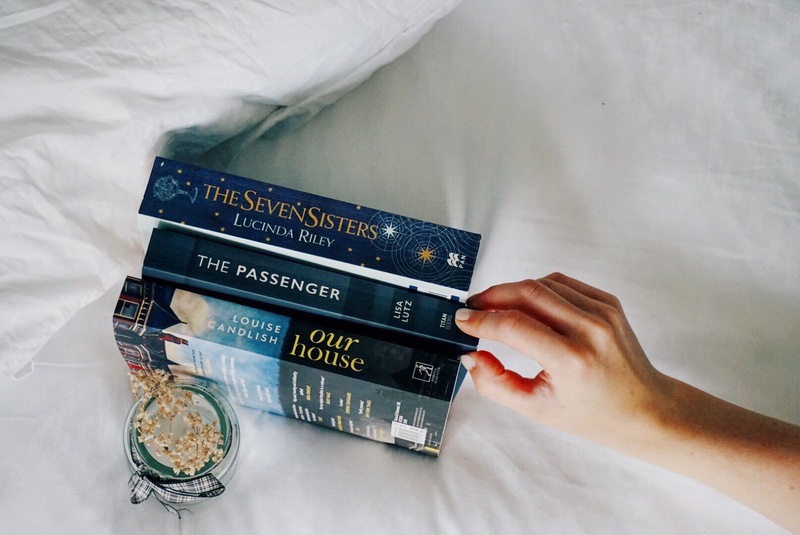 The Seven Sisters by Lucinda Riley | This book is the first of six in a series and I definitely want to read the others. Six adopted sisters are left with the opportunity to discover where they came from originally when their adoptive father dies and the first in the series follows the story of Maia. Her journey takes her to Brazil and there the plot splits between there and Paris where we find out more about her ancestors. I got so invested in the story of her ancestors that I almost forgot that was only a sub-story and I definitely enjoyed that part more than the main character's. Each of the other books tells the story of another sister and I'm hoping the very last one will tie up some loose ends with regards to the death of the adoptive father. Our House by Louise Candlish | This is a crime story and I really don't feel like I can explain the plot without essentially giving the whole thing away, which at least explains why the blurb didn't tell me much! It wasn't what I expected, which I was slightly disappointed with at first, but I really got into it. There was a character for me to like and a character for me to hate and the ending was amazing; the was a huge twist at the end that I think I actually gasped out loud at, despite being on a night flight at the time. Whoops. What have you read recently? Anything I should add to my list? If you've been to New York, then you'll know that when I say 'budget' I say it with a pinch of salt, because nothing is really on a budget in New York. However we ate pretty much as cheaply as we could, mainly by avoiding sit down meals where we'd have to tip and opting for takeout or fast food options instead. Fast food and takeout might not sound appealing to you, but we ate so much amazing food in New York, not all of it unhealthy and I wanted to document where we ate, both so I have a point of reference for if we return and in case any of you are heading there and need recommendations! I must apologise for the lack of photos in this post; all the food was honestly just so tasty I kept eating it before remembering to get my camera or phone out. I'll just have to hope my words do it justice. Chelsea Market | I'm kind of gutted we weren't staying nearer Chelsea Market because I would probably have just eaten every meal in there tbh, there's so much choice. We had breakfast from Chai Lait, which did all sorts of things, but I had a matcha smoothie bowl and a matcha latte (matcha overload much?) They have two other locations if you're not near Chelsea. Andrew's Coffee Shop | We went here purely because it was close to our hotel. It was a proper American diner experience, which I loved about it. It didn't try to be pretty or fancy, it just served good food; I had peanut butter and banana pancakes (yes you read that right, get yourself there now). Egghead | The most delicious egg sandwiches to go (mine had avocado in it). Enough said. Best Bagel & Coffee | When they say best bagel, they really mean best bagel. The bagels are huge and so doughy you can barely see the hole in them. I had a cinnamon and raisin one with cinnamon and walnut cream cheese and now I'm drooling so that's that. I 100% thought this would be a chain, but it turns out the only one is on West 35th Street, which also happened to be where our hotel was. Egg Shop | Yes I only have one lunch recommendation because we have an awfully bad habit of skipping lunch on holiday. We tend to just get so busy trying to cram a lot of stuff in that we forget or it gets too late. Our final day was a bit more relaxing though and we spent it meandering from Brooklyn through areas we hadn't managed to visit like Soho and Chinatown. Handily, halfway back to our hotel was Egg Shop, which I knew about from reading Hannah Gale's food recommendations. I believe it was the priciest meal of our trip because it is a sit down and tip sorta place, but I had the BLT poached eggs on brioche (without the bacon, obviously) and they were the best eggs I've had in my life. The coffee was equally excellent and the cafe itself is super cute so get yourself there if you can! Shake Shack | I mean, obviously. I know they have one in London, but I don't live in or near London so I've never been. We went to the one in Grand Central Station so got to eat it in beautiful surroundings too. I had some sort of fried mushroom burger and chips with cheese sauce and OH MY is all I have to say about it *drools*. Neapolitan Express | Most nights we bought food to take back to our hotel room, partly because we were knackered and also because it saved a lot of money. We stumbled upon Neapolitan Express on the way back to our hotel and I'm so glad we did because the pizza was freshly cooked in a pizza oven in front of our eyes and was incredible. Pennsy Food Hall | This was super close to our hotel so we went to have a nosey one night and ended up buying the healthiest tea we had all week from The Little Beet. They do amazing salad bowls and I had a falafel and sweet potato one which was divine. The Little Beet is a chain so they have various locations across the city too! R E A D I N G | I read two books this month thanks to our flights to New York. The first was Force of Nature by Jane Harper, the story of a work team building exercise gone wrong. It was an alright read, but not quite gripping enough for me and the ending was slightly disappointing. The second was Our House by Louise Candlish, which I assumed was going to be a thriller from the cover and the blurb, but it was more crime I'd say. It was a very good read though; I even postponed trying to sleep on the night flight back so I could finish it and the ending of this one certainly didn't disappoint. W A T C H I N G | In a shocking turn of events, I haven't binge watched anything this month. I'm very glad that Ambulance has started again though as I adore that programme. I always think if I didn't do what I did now I would be a paramedic, although I'm not sure I would actually have the guts (pardon the bad pun, I promise it was actually accidental) to deal with what they do. 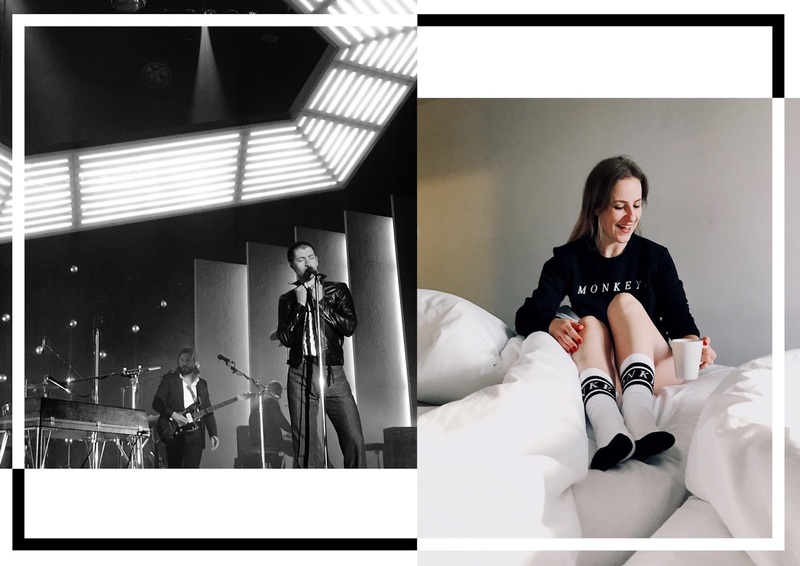 L I S T E N I N G | I'm not ashamed to say that I'm very much still in an Arctic Monkeys spiral and just as I listened to them all month in the run up to seeing them, I've been listening to them all month again to mourn how amazing they were. I even made a Spotify playlist of their set on the night I saw them so I've had that pretty much on repeat. D O I N G | I could possibly write a whole post about this section; October has been a busy one (in a good way). At the start of the month it was our nephew's Christening and that was immediately followed by our trip to New York (which you can read about here). My friend and I made a start on a new venture (@stopmotionstories on Instagram if you fancy a nosey) and I feel like I'm finally back in the swing of things blog-wise. All in all, I liked you October. Hello hello and welcome to a post on the topic that everyone is talking about thanks to that documentary. If you haven't watched it, I sincerely recommend that you do as it provides some serious pause for thought. In a nutshell, our addiction to fast fashion is seriously harming the environment as well as affecting people's lives and health. I was a little late to the bandwagon so I'd already seen a fair few people air their thoughts on social media and I knew it would make me reassess my attitude to fast fashion. Said knowledge meant that I made an ASOS order right before I sat down to watch it, purely because I knew I wouldn't want to make one afterwards. I feel like I need to admit that because this certainly isn't a post in which I'm going to claim to be some sort of saint. Anyway, it seems as thought this is becoming a topic of contention; I've seen influencers claim they'll be completely changing their shopping habits, I've seen influencers accuse other influencers of being fake and jumping on the bandwagon and some have simply kept quiet, because at the end of the day it's their livelihood and they can't just up and leave it can they? I'm going to split this post into three sections; guilt, wariness and decisions (bet you didn't guess that from the title did you?) because I felt that was the best way to get all my opinions across without them becoming a jumbled mess of 'lol what's she trying to say here?' which seems to often be my trademark. G U I L T | I'm sure most people who've watched the Stacey Dooley documentary felt this. We are the fast fashion generation; we like to express ourselves through clothes, they're available to us at the click of a button for affordable prices and new trends that we simply 'must have' are emerging all the time. Even as someone who isn't particularly trend led, I still buy a lot of clothes. It's my hobby, a way of expressing myself and I actually genuinely enjoy getting dressed in the morning. So after watching the documentary, then looking at my bulging wardrobe (plus the clothes rail and six drawers of overflow) I did feel incredibly guilty. Obviously I can claim 'oh but I didn't know', 'why did nobody ever tell me? ', but the reality is I have made absolutely zero effort to find out where my clothes came from, where and how they were made and whether the process was at all ethical. I'm going to make a mass generalisation here so please don't be offended if this doesn't apply to you, but I think a lot of us are guilty of being ignorant. We simply choose to ignore or not find out about things and then when we do, we express our shock and outrage so we uphold our reputation as good people. Maybe we are good people, but that doesn't mean we haven't been ignorant and lazy (including myself in this by the way). W A R I N E S S | And here enters the wariness. Yes I feel guilty about my consumption of fast fashion and I haven't bought any clothes since watching the documentary, but it's true that people do jump on the bandwagon with these kinds of issues and then forget about them when the uproar dies down. I don't want to be one of those people so I'm almost wary about speaking out too much in case I cave and miss ASOS too much. 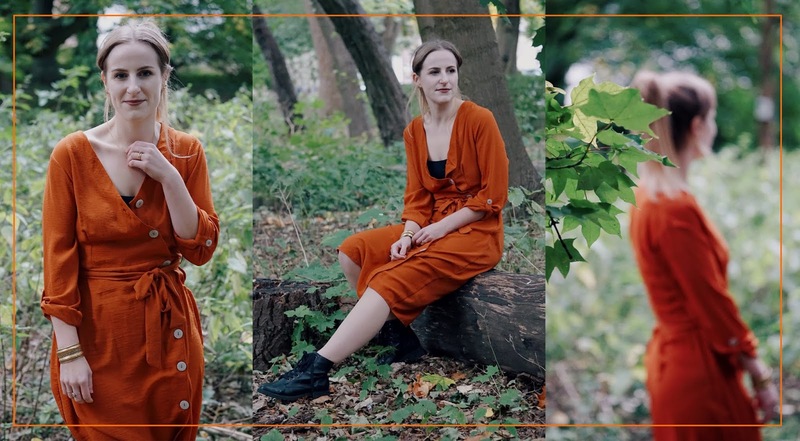 I'm also aware that there are plenty of eco-friendly and sustainable bloggers already who, quite rightly, would look at me as someone who has zero right to speak about this issue because of my fast fashion consumption. But at the same time, any discussion surrounding the issue can only be a good thing as can any change, however big or small. D E C I S I O N S | Which brings me to...what am I actually going to do about it? Well I'm certainly not making any grand gestures. I've deleted the ASOS app though and I'm going to do no spend November. I'm going to start using charity shops a lot more (luckily there's an excellent vintage one ten minutes from my house). I haven't found any sustainable clothing brands that I'm particularly excited about yet, especially as they are all expensive (yes I KNOW the point is to spend more on less, but my brain doesn't work that way) so I can't say I won't be making the odd high street purchase because I will be. 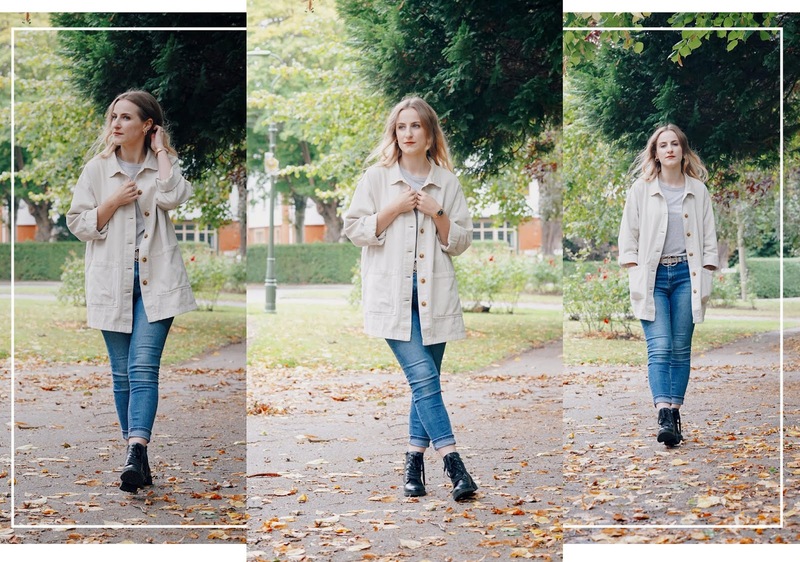 I've always shopped my wardrobe anyway (my bulging wardrobe is because I hardly ever get rid of anything) and I'll be digging out more outfits like the classic in this post, which I re-wear every autumn. In my opinion, it's not about stopping completely or anything drastic, it's simply about being more mindful; changing whatever you're in a position to change and not jumping down the throats of people who aren't doing the same as you. This post is sponsored by Soho Home. I promise (to myself more than anyone else) that sometime soon I will do a living room transformation post, but there are still a couple of things that need finishing off and tweaking so in the meantime I thought I'd write about the things we've done to really make it feel homely, like our living room. I won't lie, I've grown quite tired of the renovation process; the relentless wallpaper stripping, floor sanding, painting etc etc, but what I do love is putting a room back together. I love choosing furniture, deciding what pictures to have on the wall, filling a room with rugs and sofa cushions. 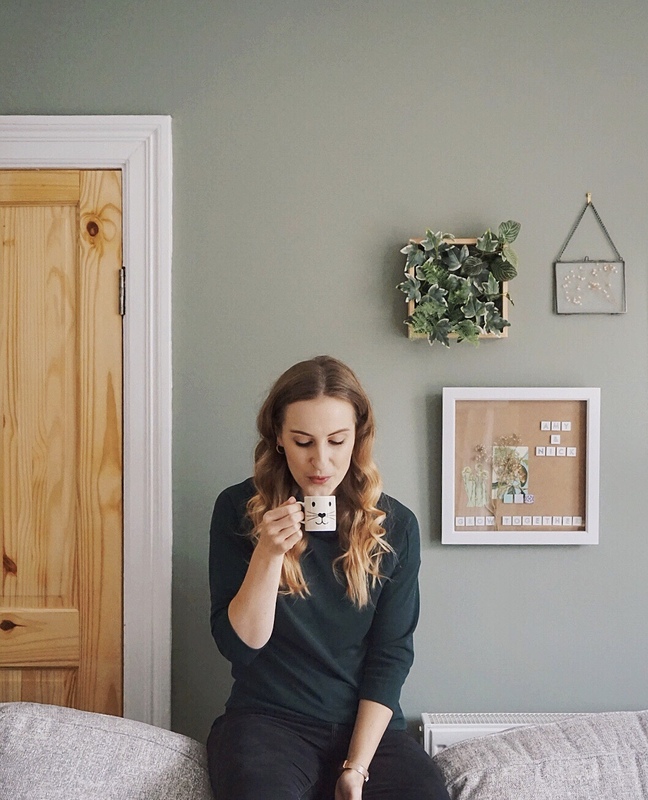 So that's what I'm going to document in this post; the finishing touches that I've loved taking time over, that add a bit of our personalities to the room and that make it an enjoyable place to spend time in. S O F A | We decided on a corner sofa for the cosy factor and I'm so glad we did because I can basically make myself a warm little nest in the corner and binge watch TV. Pretty perfect winter situation amiright? I love adding cushions and throws to our sofa so we have rather a lot of them (enough for me to have a fair few guests over and allocate each of them their own throw #perfecthostess). I love how cushions and throws add colour to an otherwise neutral sofa and that they give the flexibility to add new colours into the room whenever you wish! P R I N T W A L L | I've written before about our print wall, which I spent rather a long time on, but I absolutely adore it. Because we didn't rush into choosing prints and other elements to put up, it feels really curated and special. I'm so pleased we decided to diversify it and include a mirror, clock and a hanging plant rather than just prints as it feels so thought out. I'm super happy with it. R U G S | Having laminate floor in the living room means it looked (and felt) a little cold when we first put it down. We came up with the idea of having lots of different rugs in the room to add a bit of colour, texture and much needed warmth! I love the look of them layered and we're still adding to the collection! F U R N I T U R E | I am very lucky that I have a clever husband who made our furniture for the living room, meaning that we didn't have to spend a lot of money on two tables and a TV stand that look amazing. We went for a lot of wood in the living room and it's quite a dark room to make it feel cosy so the wooden tables match the aesthetic perfectly. I'm very into mismatched furniture because I don't like things to look too uniform so they're all slightly different woods and we (I say we, I mean Nick) added a touch of grey paint to the TV stand to match the grey of the sofa. What are your favourite finishing touches to your living room? I think I'm just about getting used to the idea of Autumn. This summer was a difficult one to say goodbye to, especially as it seemed to disappear so quickly, but the idea of snug nights in and all the knitwear is starting to make me feel the tiniest bit excited. 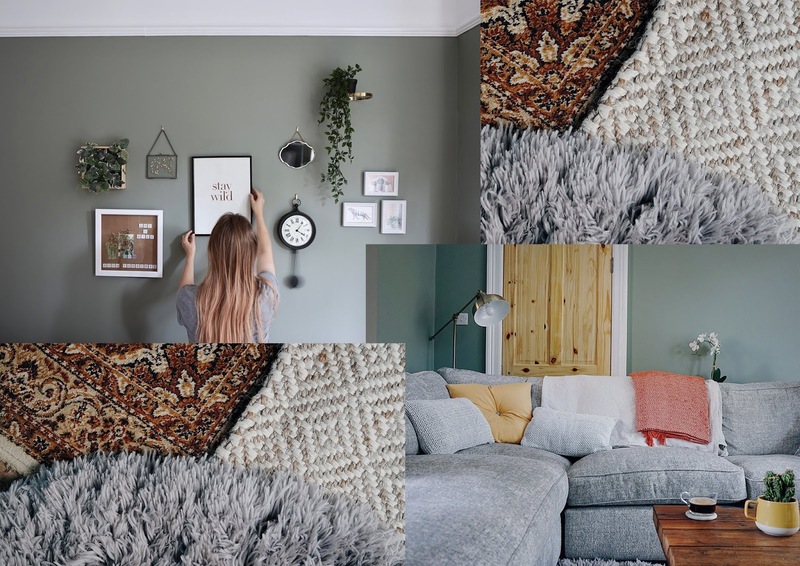 Throughout Autumn, the HEY Bloggers founders (myself, Emma, Ashton, Violet, Jenny and Alex) will each be sharing a room in our house that we've made seasonal updates to, a room that becomes a 'hotspot' for us during the colder months, in collaboration with Ideal Boilers. This is not a sponsored post, but some of the items featured have been purchased with a voucher provided by the lovely team at Ideal Boilers. When you think of making a room snug for the colder months, the kitchen isn't a room that would immediately spring to mind. Maybe you think of your warm living room or the bed you never want to leave on those cold mornings. However, as our kitchen doubles up as a dining room, we really do spend a lot of time in there. I eat my breakfast in there everyday and when Nick and I do have a rare meal time together (#shiftworklife) we always eat at the table (not because we're traditional, but because I don't trust Nick to not spill on the sofa). A T M O S P H E R E | Nothing says autumn to me more than candles and fairy lights because they add such an atmosphere of warmth to a room. 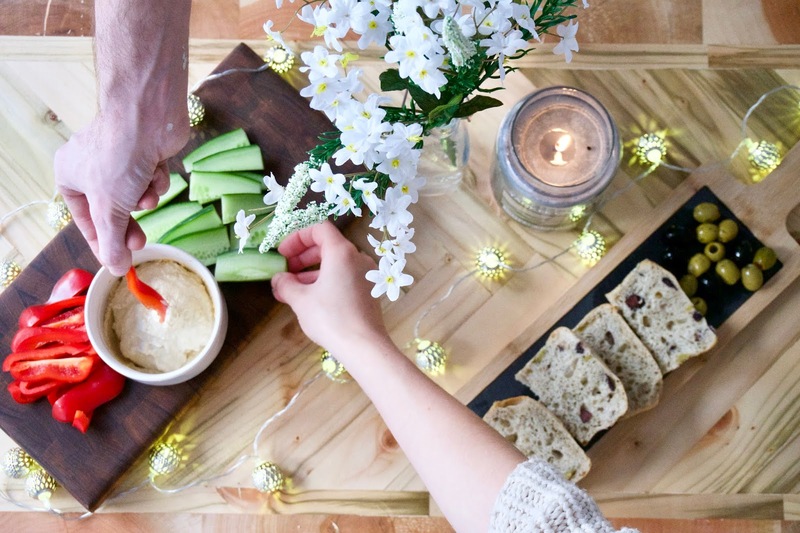 I picked up these fairy lights* from Wilko's and they look so cute hung round our mirror, but for dinner parties (lol I say dinner parties trying to sound sophisticated, I basically mean having friends over for lasagne) they make such a good table decoration. I have candles burning in every room throughout autumn and winter and the kitchen is no exception. 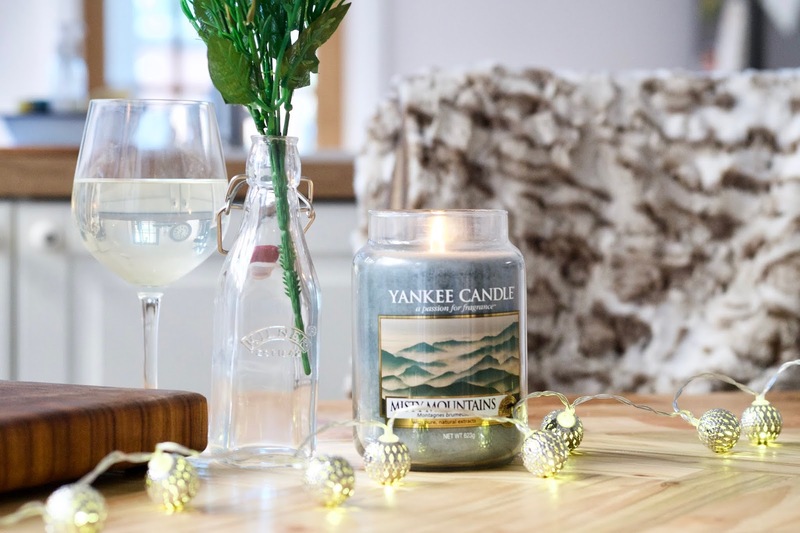 Yankee Candle are a long term favourite of mine and they've just launched a new range called Just Go,* inspired by travel and allowing us to take our summer memories into autumn with us! 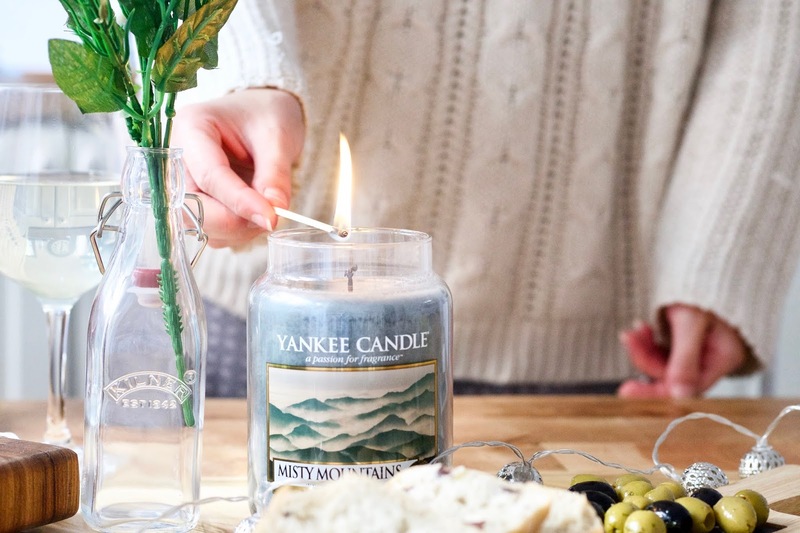 My favourite is misty mountains; it smells super fresh and rids the kitchen of any pesky food smells in no time. 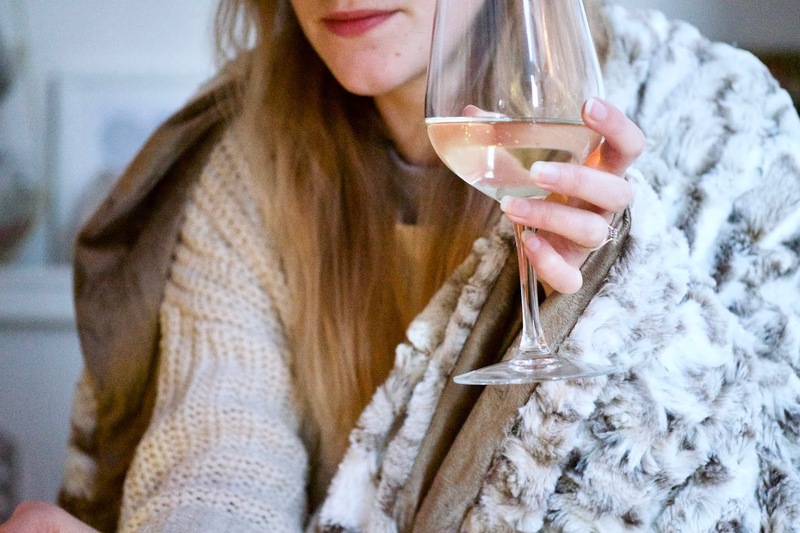 W A R M T H | Moving on from an atmosphere of warmth to actual warmth...put the heating on! I jest, I'm sure you don't need a blog post to tell you to put your heating on. I'm talking about blankets and throws because they don't just have to be for the bed or the sofa. I personally love a throw* over the back of my dining room chairs that I can make use of if I'm feeling a little chilly. They also just look nice and add a little summin' summin' don't they? T H E T A B L E | In the lead up to Christmas (I'm sorry, I know, I said the 'C' word) I always feel more in the mood for making my table look aesthetically pleasing (sorry for using the phrase aesthetically pleasing, but I find it a very aesthetically pleasing phrase). I think it's probably down to all the home magazines/interior shops showing off Christmas table displays, but isn't it funny how making your table look nice makes for a more enjoyable meal? This set up is certainly preferable to the jumble of junk mail/keys/screwdrivers that usually graces our kitchen table. I'm obsessed with wood at the moment, which is handy because Nick has just started making real wooden chopping boards so I'll be displaying food on those and on this slate one* I picked up in Wilko's. Which room in your house is your #IdealHotspot? New York is somewhere I've wanted to visit for a long time, but somewhere that's never really been affordable to us and somewhere we actually dismissed as a honeymoon destination for that reason. However, it turns out that people are rather generous when you get married and despite not asking for gifts, we did receive quite a bit of money. So obviously instead of putting it to any sort of good use around the house/garden/savings account, we booked a holiday to New York. As a first-timer, I wanted to do all the stereotypical New York stuff so we decided to buy New York Passes, which would cover everything we wanted to do. As well as just have a general chit chat about what we did, I'll let you know my thoughts on whether the pass was worth it or not. We actually got ours in a sale, and from keeping an eye on them for a while I can tell you that they do have sales fairly frequently so it's definitely worth waiting for one of those so you get even more money off. Day one began with an early wake up at 5.30 because our body clocks were obviously still attuned to UK time. It was actually quite nice to wake up so early to the view of the city through our hotel (huge) window and actually feel awake, then be able to get ready at leisure and still be out on the street at 7.30. The first thing we did was head to The Rockefeller Center, via Times Square just to see it (anti-climatic during the day FYI) and we were some of the first people in the (non-existent) queue to head to the Top of the Rock. It was a bit foggy, but despite the fact that we probably couldn't see as far as you usually can, I thought it added a certain breathtaking atmosphere to the experience. As the Museum of Modern Art is pretty much next door, we headed there next and we also visited The Met on our first day too. The MoMA is quite quick to wander around, but The Met is similar to The V&A (i.e. absolutely huge and full of so much stuff you could be in there all day). We grabbed a map and decided which sections of it we wanted to see as well as googling any paintings we definitely wanted to see to see where they were. It's worth mentioning that we didn't pay for anything apart from food on our first day because everything we did was covered by the New York Pass. 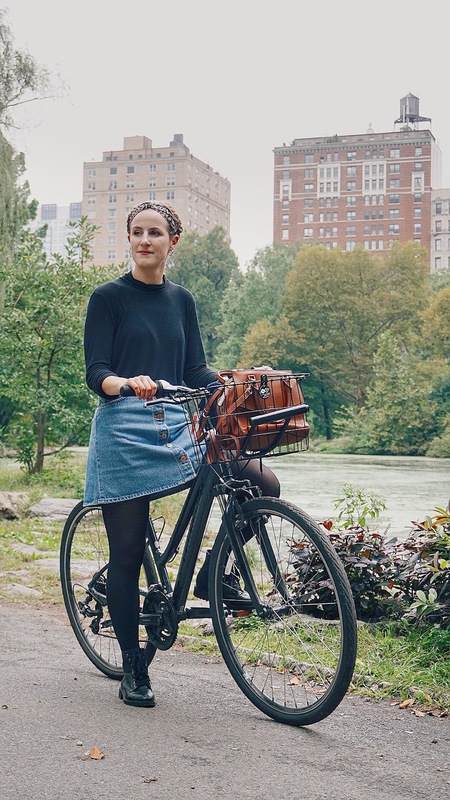 One thing we did that I don't think we would have if it hadn't been included (simply because we wouldn't have thought of it) was hire bikes to cycle around Central Park. Central Park is absolutely huge and a bit of a labyrinth so a cycle ride was an excellent way to take a lot of it in without getting lost or spending a full day in there. I finally learnt how to use my gears properly too (three cheers?). To finish the day we went to the top of the Empire State Building (via Grand Central Station to have a nosey - can confirm it's as beautiful as everyone says). 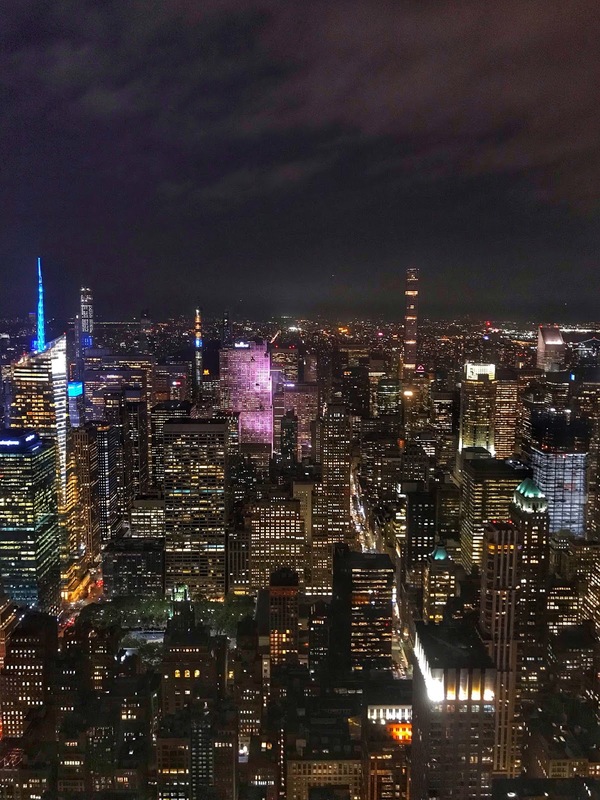 The queue for the Empire State Building was a bit of a mare, but worth it for the nighttime views. I'd definitely recommend going up one of the tall buildings at nighttime because it's actually more impressive than during the day (I was v happy we did one of each though). D A Y T W O | Day Two was a much more sobering day because we decided to do all the 9/11 stuff. It was so so upsetting, but I also feel like it's very important to see if you're in New York because it's such a massive part of everyone's lives there and obviously had an enormous impact. We began with the 9/11 Ground Zero workshop, which is actually in Chelsea. It was a very small museum set up by the official photographer of the recovery operation, who also captured a photo of 9/11 happening from the top of the very building the workshop is in. A lot of his photographs, plus artefacts recovered from the rubble are displayed there and you're told the story behind each one. You will leave very humbled. For some light relief, we walked the High Line back to Midtown then hopped on the water taxi to take us round to the 9/11 memorial and museum. The memorials are an absolutely stunning tribute and the museum in between them tells the story of what happened on that day. Again, it's very upsetting, but important. We hopped back on the water taxi in time for sunset, which takes you all around Manhattan and also stops off right next to the Statue of Liberty for a photo opportunity. D A Y T H R E E | It absolutely chucked it down on this day so we needed to do something inside. Because the hop on/off bus tour was included in our New York Pass we decided to use that to get around and we caught it to Central Park where we visited the Natural History Museum. Again, this was huge and you could spend a long time there so we narrowed down what we wanted to see and wandered round that (drying off in the process) because despite catching the bus we got abolutely soaked walking through Central Park to the museum. Because there was so much of New York we still hadn't seen (and weren't going to get the chance to) we decided to do almost the full hop on/off bus tour in order to see it. A bus tour isn't something we would usually do, but it was actually a really good way to see the city (despite switching between the top and lower decks every time it started or stopped raining). The tour took about two hours in total and I was glad we'd at least seen some of the parts of New York we wanted even if we hadn't explored them. Day three was also the last day of our New York pass, as we opted for a three day one. Absolutely everything listed above was covered by the pass so the only expense we had was food. We did tot it all up and if we'd paid for everything it would have been double the price we paid for the pass. That probably means we wouldn't have actually done all of it, so for both of those reasons it's definitely worth it (for first timers at least). 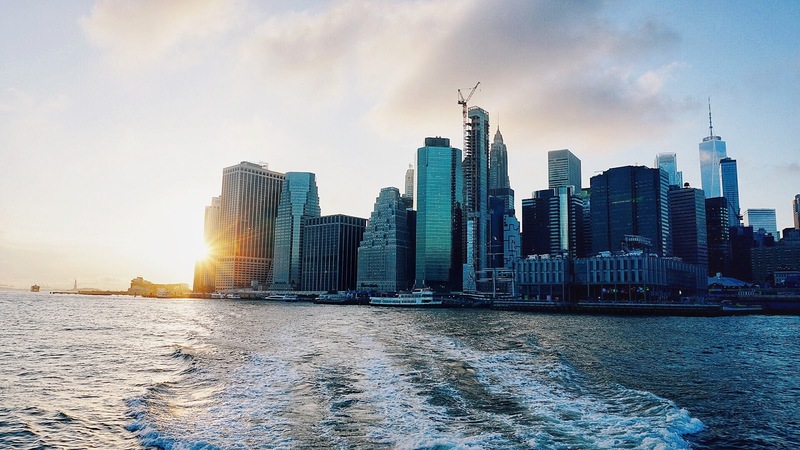 We only scratched the surface with what's available on the pass; almost everything you'd want to do in New York is covered. D A Y F O U R | Our last day we didn't have the pass so we wanted to stick to doing free things and I wanted to get a bit further afield. We got the subway to Brooklyn, where we had coffee and a wander along the river. There's immediately a completely different vibe in Brooklyn and if I go back I think I'd want to stay that side of the river for sure. We crossed the Brooklyn Bridge (which I'm actually shocked that people sit on for photos because people were sitting on a ledge directly above the road, soz side note from sensible Amy but seriously). We then walked all the back from the bridge to our hotel in Midtown, stopping along the way in parks and for lunch (luckily it was a beautiful day). One of my favourite things to do anywhere is to just walk around because I always find you see so much of a place so despite really not doing much apart from walking and eating on our last day, I think it was my favourite. Four Out Of Five. Doesn't time fly? Months since we booked our tickets to see Arctic Monkeys, it finally happened on Friday. Brianstorm. We got top marks for not trying and got right to the front. Snap Out Of It. 15-year old fangirl Amy well and truly resurfaced on Friday and I still can't snap out of it. Crying Lightning. One of the most surreal things I've experienced at a gig was the support act actually getting heckled off the stage, which consisted of the strange premature departure of the lead singer after repeatedly whacking himself on the head with his mic...yes, really. One Point Perspective. We quite literally lost our train of thought when the next day we managed to be half an hour early for our train only to miss it because we were too busy watching videos from the night before. Teddy Picker. I was planning on putting something on Instagram stories the same night, but I was actually so overwhelmed I had to save it for the morning after. One For The Road. Getting tickets for Newcastle was a double whammy of happy and such a nostalgic feeling looking around the arena knowing I've been here before because it was where I saw my very first concert (Smash Hits cause I was cool). 505. Cue me and Ashton afterwards googling any other upcoming Arctic Monkeys gigs whether they'd take a seven hour flight or a 45 minute drive. 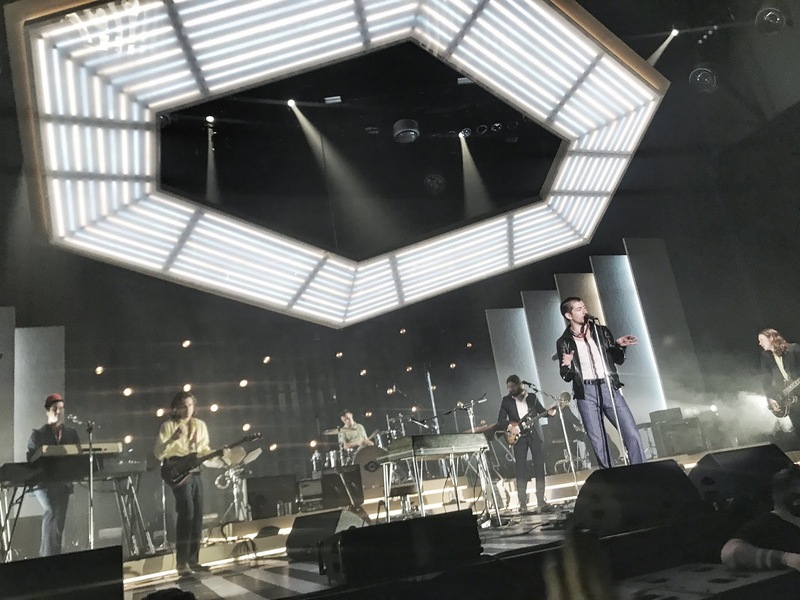 Tranquility Base Hotel & Casino. We popped on Arctic Monkeys while we were getting ready (obviously) to really get me in the mood. The Ultracheese. As soon as the first song started the crowd surged forwards and went mad, which I haven't experience in a while, but didn't that used to be part of the fun? Dancing Shoes. While we were waiting and waiting for Arctic Monkeys to come onstage I was whacked on the head, called 'huffy' and nearly deafened. I'm the innocent party here. Do Me A Favour. I think I'm going to be mourning the gig for several hours or several weeks because it was just SO good. Cornerstone. Despite there being a lot of pushing and shoving like at any gig, we were luckily surrounded by mostly lovely people who apologised awfully politely whenever they were squashed up against us. Pretty Visitors. Sorry for fangirling (again), but you can't beat that moment they first came on stage and started playing. Everyone waved their arms. Do I Wanna Know? Ashton managed to catch my favourite part of 505 on her phone and I still play it on repeat until I fall asleep, much to Nick's annoyance. Arabella. Forget that little lady Arabella, we've already decided that the next song Alex Turner writes is going to be titled Girl In The Crowd. Yes, it's about me. Star Treatment. Golden boy's certainly not in bad shape. Those hips though...need I say more? Mardy Bum. A perfect description of me getting sad before it was even over because I knew it was about to be...I'd certainly got the face on. I Bet That You Look Good On The Dancefloor. You bet wrong Alex. At this point, I'm pretty sure I was just a squished head poking out of the crowd screaming lyrics and holding onto Ashton for dear life. R U Mine? R U Alex? Call me shallow (new blog name lols), but what I'm wearing can massively affect how I feel about myself and I think that's something that applies to a lot of people. An outfit has the ability to lift my confidence and make me feel generally better about myself. I sometimes feel like I should be writing about something more worthy than just clothes, but when clothes affect your self-confidence so much, they're actually quite important yes? 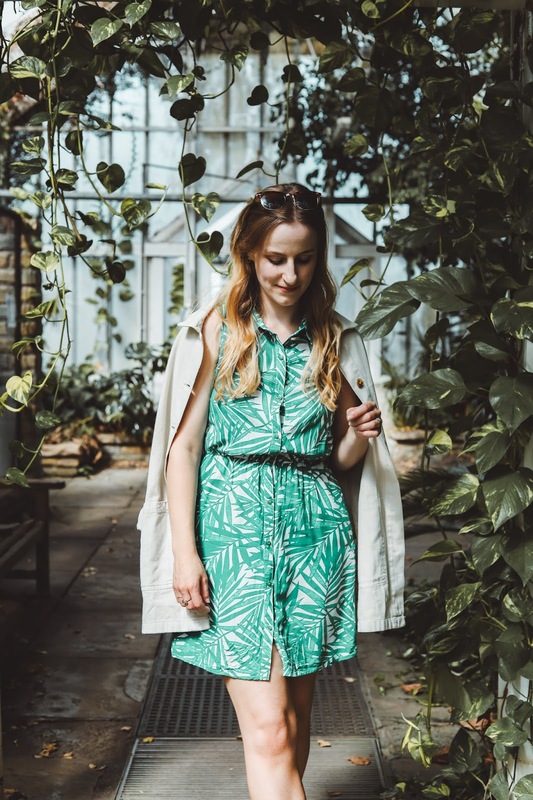 Apologies for the very unimaginative post title, but sometimes you've gotta say what you see and I really wanted to write a post about a few of the things I've been doing with my outfits recently that have instantly changed the way I feel about myself. Despite the fact that I probably don't actually look cool at all, these are the small things that make me feel as though I am. Rolling up my sleeves | Told you they were small things. Whenever I've been wearing a long sleeved top/jumper/shirt/jacket I've been rolling up my sleeves a little and it can transform what felt like something shapeless and baggy into something chic and oversized. I actually almost sent this jacket back when I first ordered it because I felt like a sack, but then I tried it with the sleeves rolled up and now I can't seem to take it off. Wearing a belt | OK, so I'm not quite sure where I've been because I realise that everyone who isn't me has been wearing a belt forever, but I haven't worn one since those ginormous elasticated waist belts were a thing (thank god they no longer are cause they were hella uncomfortable amiright?). But recently (newsflash) I've started wearing a belt, like an actual functional one to hold up my jeans. This means that a) my jeans fit way better and b) I all of a sudden feel like a real grown up adult who wears a belt and has her life together. Revolutionary. 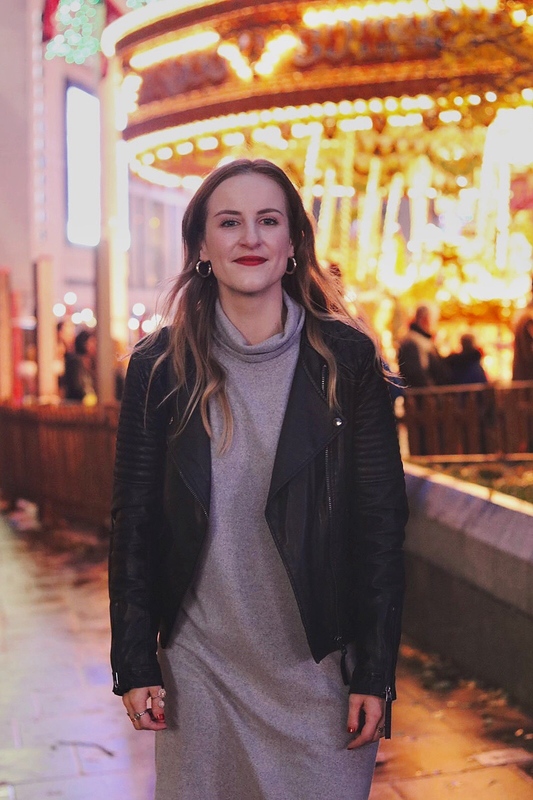 Tucking in my tops | I've been tucking tops into high waisted trousers on and off for ages, and although I'd always feel cooler with them tucked in, I'd often wear tops loose so that they'd cover up that low stomach area that I'm not quite sure what to call. Recently though, I'm trying not to care. That part of my stomach may not always look flat under my jeans, but tucking my top in makes me feel cool so I'm gonna do it. Rolling up my jeans | It would appear that I just like rolling things up. I've always been more of an ankle grazer kinda gal than full length, but I am blessed with disproportionately short legs (yes that is sarcasm) so jeans sold as ankle grazers are just normal length on me. Not only does rolling up my jeans make them my desired ankle grazing length, I also like how it looks. Simple as that. Wearing a watch | Similarly to the belt thing, I'm obviously a bit behind on this one. I always saw watches as something functional rather than something that could also look good, but having been gifted a few in the past year (including the one in this post) I now rarely don't wear one because, guess what, they look good, they're actually pretty darn useful and they somehow make me feel like I have my life together. Do you have any outfit tricks that make you feel good?